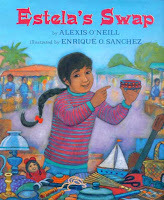 La Bloga interviews author and SCBWI Ventura Regional Advisor Alexis O'Neill (Estela's Swap / Lee & Low) about creating authenticity in picture books from the outside. "The words and images must ring true to people within that culture in terms of syntax, behavior, beliefs and dress," says O'Neill. And from blogger Crazy Quilts (who describes herself as "an African American female librarian hoping to improve the literacy of urban students") comes news of The Latino Book & Family Festival and a list of '07 School Reads for Students of Color.